For many years now, killing frosts have arrived late, so much so that cool weather and short days sap the vitality from summer vegetables before frost arrives. The plants peter out so I have no qualms about clearing them out of the garden before they are dead. As a matter of fact, they look so forlorn that I’m anxious to clear them away and neaten up the garden. 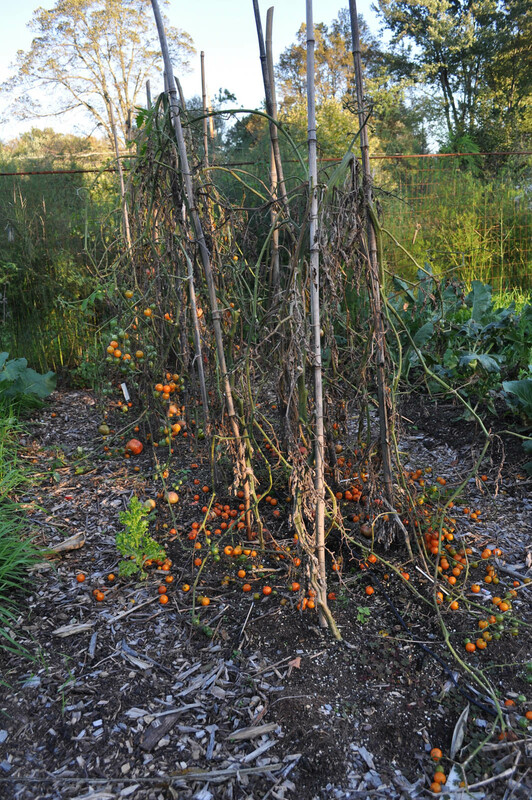 Cleanup is especially important with tomatoes because a few diseases, such as early blight and leaf spot diseases, wait out winter on plant residues to infect next year’s plants. 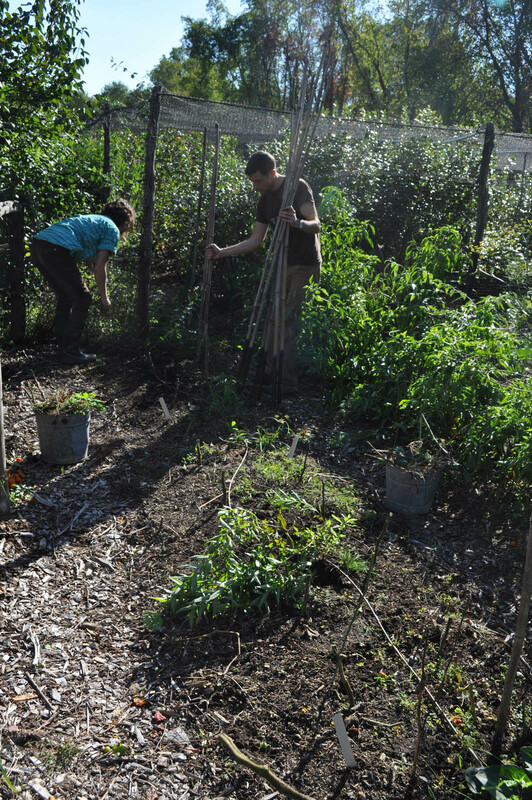 I clean up every bit of stem, leaf, and fruit possible, hand picking to begin with and then finally giving each bed a light raking to gather up remaining debris. With a garden knife, I cut into the ground around the base of each plant to make it easy to remove the stem and largest roots. Small roots stay in the soil, decomposing to become humus and to leave behind large and small channels for air and water movement. All that spent tomato stuff goes into the compost pile where time and temperature do their job defusing pathogens and creating rich compost. Just to make sure that pest problems are minimized next year, and to enrich and protect the ground, I cover each bed with an inch depth of finished compost from piles built last year. Disease spores can’t get up through the compost blanket. And then, to further limit pest problems, next year’s tomatoes go in a different bed than this year’s tomatoes. Even with the declining tomatoes and other summer vegetables, the garden generally doesn’t look forlorn. Beds of late green beans, sweet corn, and squash that were cleared, cleaned, and composted over the past few weeks look neat and weed-free. To me, something like the zen gardens at Ryōan-ji, except with compost and straight lines instead of neatly raked gravel. Grassy blades of oats are sprouting with all the youthful exuberance of spring in beds that were readied before the end of September. And long before summer vegetables started to wane, I snuck autumn vegetables into the garden, so some beds are now lush with radishes, arugula, lettuce, cabbage, and other greenery that thoroughly enjoys this cool, wet weather. Chojuro is one of a few Asian pears, also called nashi, that I grow; it’s my favorite as far as productivity and flavor, my others being Yoinashi, Yakumo, and Seuri-Li. Because they are generally round and crunchy, Asian pears are also sometimes called apple pears or salad pears. They have a long history in Asia, and over a thousand varieties exist. My pears were planted 10 years ago, actually not planted but grafted on existing rootstocks to replace other, less satisfactory varieties. 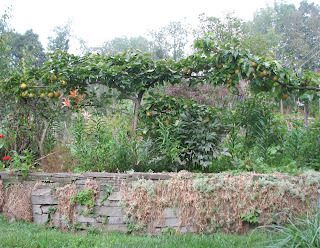 The rootstocks are dwarfing and the plan was to train them as a row of espaliers en arcure, that is with successive tiers of branches gently arching in curves to meet those of neighboring pear plants, all sitting in a row atop a low wall. 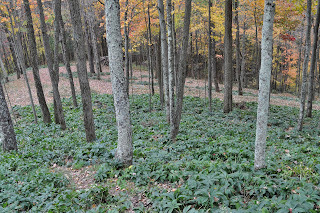 But deer soon discovered the plants, which became a smorgasbord for which the deer didn’t even have to bend down to enjoy. 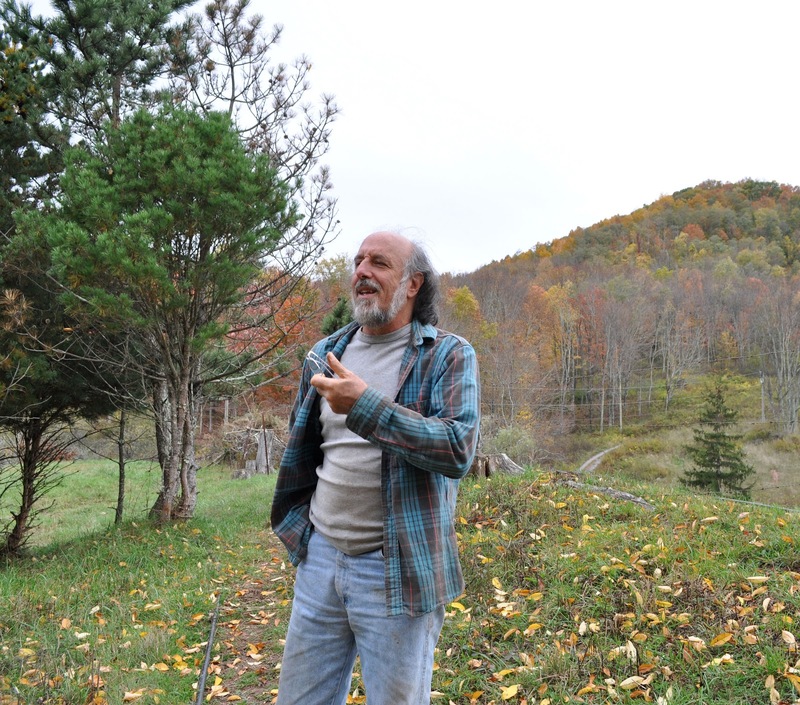 The deer problem was eventually solved but the plants were not en arcure anymore. I could have lopped everything back to just above the grafts and started again but lacked the heart to do it because the trees were, by then, bearing fruits. So now I have an arcure-esque espaliers laden with fruit. And especially laden is the Chojuro tree, every year. Asian pears differ from the more common European pears in a number of ways. They are generally easier to grow. With large, healthy leaves, they tend to be more decorative. 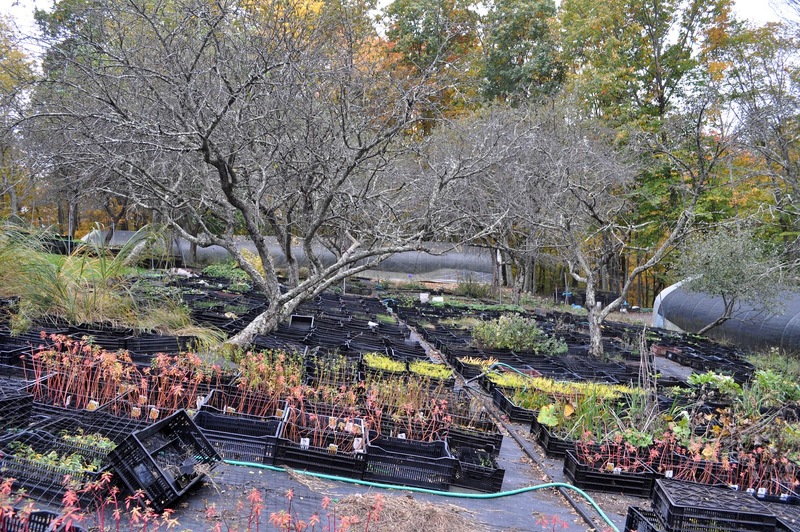 They bear more heavily and at a younger age, so much so that you have to be careful not to let plants on dwarfing rootstocks bear too much too young and runt out. 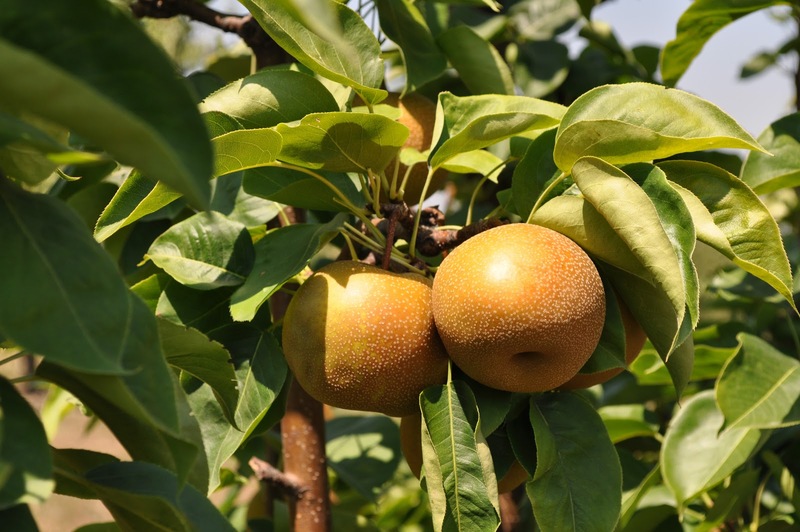 And while European pears must be harvested before they are ripe, then ripened off the trees, Asian pears don’t taste at their best until they are dead ripe on the tree. Even then, they don’t taste at their very best if the trees overbear, which they are wont to do. 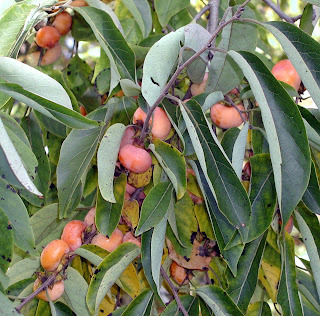 So beginning in June, and a few more times through summer, I kept pinching off enough fruits so that eventually remaining fruits were a couple of inches apart. It was worth it for the crunchy, juice-laden, butterscotch-flavored Chojuros. In fact, I only saw a couple of squirrels the whole season. They were two young ones gamboling in the tree tops, taunting me in full view from the back window of my bedroom. 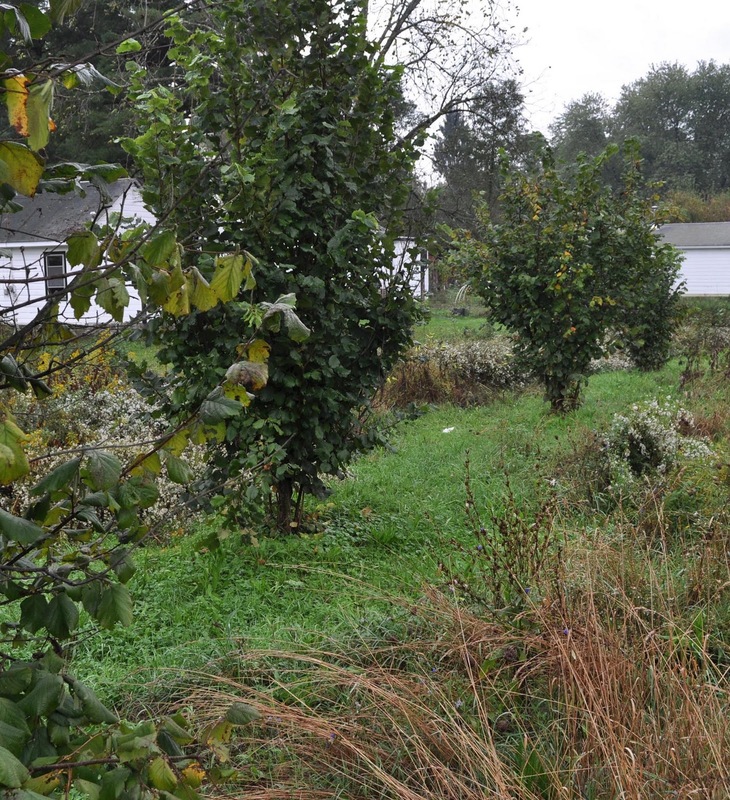 To reduce competition for water and nutrients to the hazelnut plants from the meadow, I kept vegetation scythed down in a circle around each hazelnut bush and accessed the plants via a mowed path that originates only 50 feet across mowed lawn from my deck. My two dogs, Leila and Scooter, spend a lot of time sleeping on that sunny deck, so it would take a bold squirrel indeed to make the journey across the lawn and then down that no-exit, mowed path in overgrown meadow. As for anyone who pooh-poohs my obsession with squirrels, mark my words: In a few years you’ll consider them much, much worse problems than deer. Some people tell me that squirrels are even eating their tomatoes. Fencing is, obviously, useless against squirrels. Squirrels have never eaten my tomatoes. I’ve never even seen them in my vegetable gardens although black walnut seedlings that sometimes pop up here and there are evidence of their occasional trespass. I wonder if squirrels eat lettuce; I hope not, because I have some nice heads developing in the garden and in seed flats. This is the time of year that takes advance planning with lettuce because, although the plants enjoy the cooler weather, it, along with shorter days, drastically slows growth. I aim to grow enough lettuce for salads all winter so must have enough plants started to slowly mature in the weeks and months ahead. If the plants are too small, they won’t size up when it’s their turn to be eaten. If the plants are too large, they bolt, that is, make seedstalks and turn bitter. 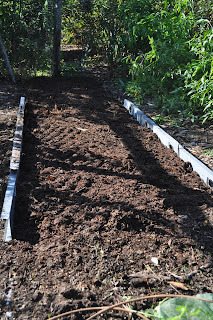 Right now, I have two rows of mature heads in the garden and over 150 seedlings of various sizes. All those seedlings take up only about 4 square feet of space. The smaller seedlings will get transplanted into the greenhouse sometime soon. Greenhouse lettuce can tolerate a little shade right now, but not in a few weeks. That works out perfectly, because right now the greenhouse is shaded by 3 large fig trees growing within. They are three different varieties, each loaded with fruit. 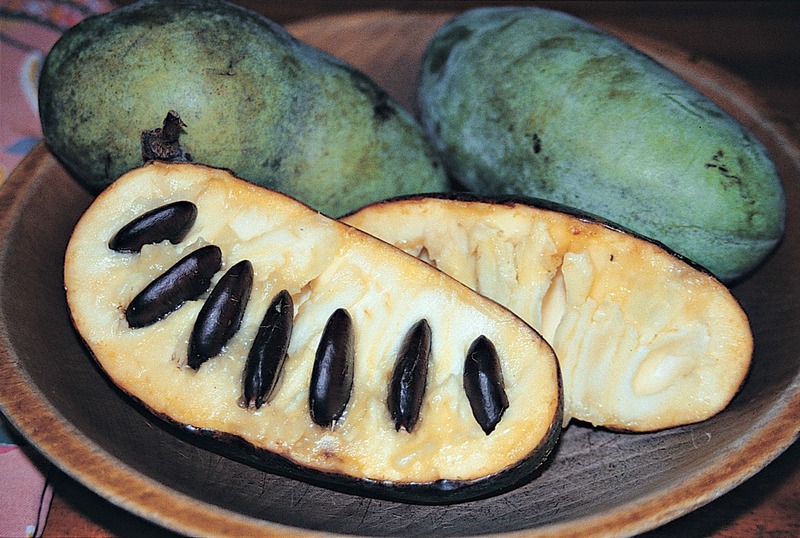 Kadota is the best-tasting of the three, with a sweet, rich flavor held in a chewy skin. The problem is that Kadota likes dry weather, as do all figs, to some degree. With the current humid weather and incessant rain, many of the Kadota fruits rot just as they are about to ripen. My old standby, Brown Turkey, sweet, small, and dark purple, does better. The tree has been ripening fruits since about early September. The best of the lot, in terms of flavor (not as good as Kadota but, still, very good) is Green Ischia, also known as Verte. This variety bears fruits on stems that grew last year as well as, like my other two varieties, stems that started growing this year. 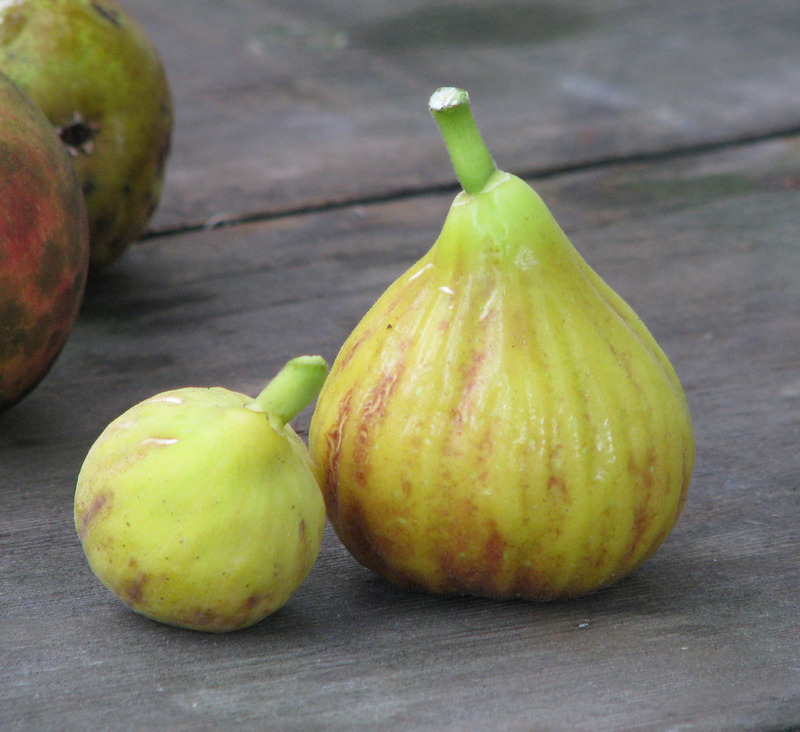 Green Ischia’s earliest figs ripen in July on last year’s stems, followed by more fruits, beginning in September, on this year’ stems. The figs are sweet and very large and juicy, so much so that they begin to burst open if harvest is delayed too long. My Green Ischia, by the way, is probably not Green Ischia; figs are notorious for having multiple names and for being mislabeled, as I think mine was in the nursery. The fig crop will end in a few weeks, the plants’ leaves will fall, and I’ll cut back all stems, except for a few on Green Ischia for next year’s early crop, down to about 4 feet high. Greenhouse lettuce can then bask freely in whatever sunlight autumn and winter sun offers. I didn’t need the house number to hone in on Bassem’s home in Bethlehem, Pennsylvania last Saturday. 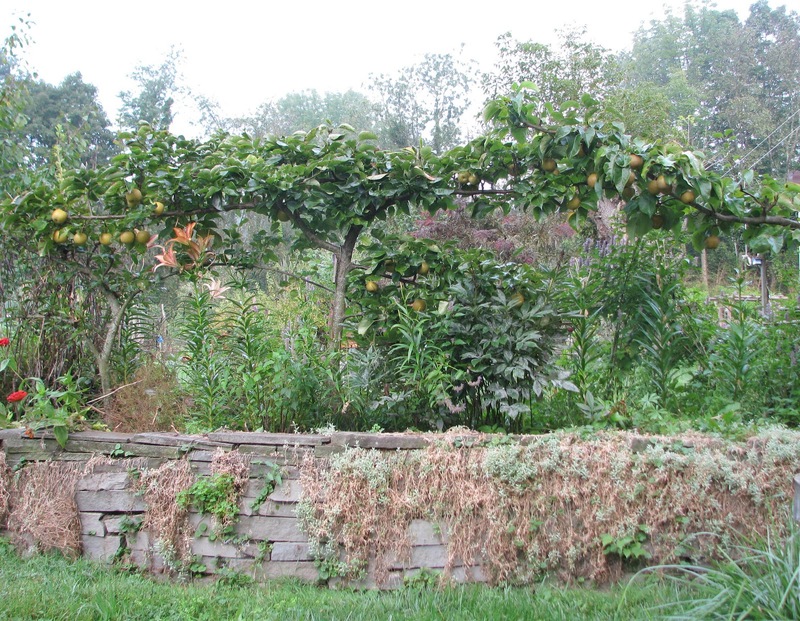 The Asian persimmon, pawpaw, and fig trees rising above the front hedge distinguished the landscape from those of the neighbors’ more conventional -- and much less luscious -- home grounds. 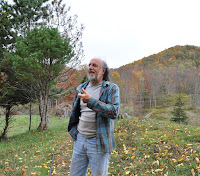 Over the years, I have corresponded with Bassem, a fellow member of North American Fruit Explorers (www.nafex.org), and had planned to sometime stop by on one of my frequent trips to Philadelphia. Finally, I took that fruitful side step. 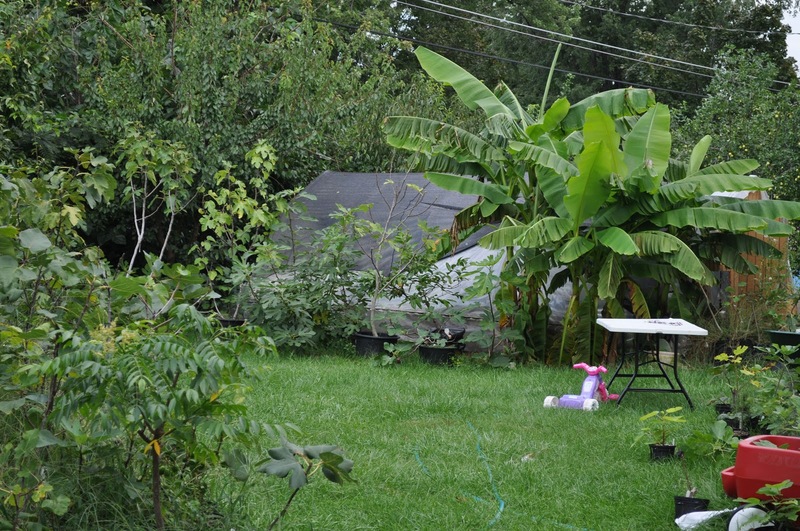 The backyard is home to a small greenhouse, in which Bassem overwinters some tropical fruits, and more fruit plants. A few large banana trees rose right next to the greenhouse -- very decorative but not able, of course, to ripen fruit. 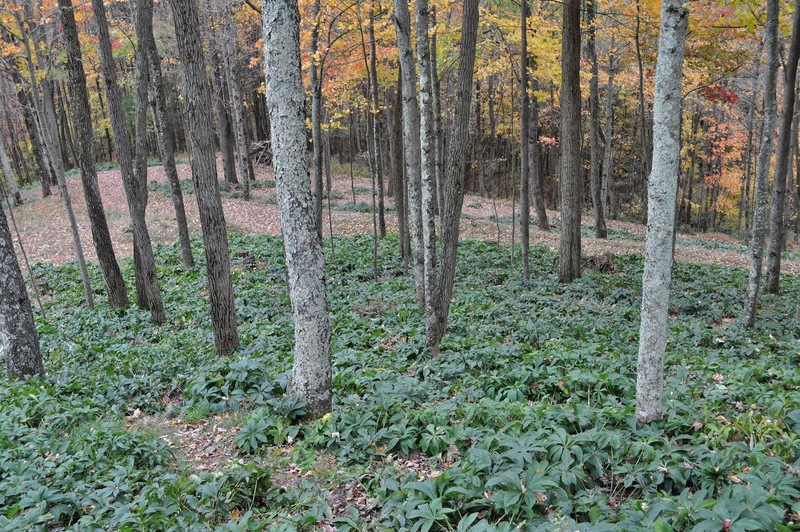 They die to the ground each year and then sprout from overwintered roots each spring. An eight-foot-tall papaya plant, grown from seeds sown in spring, was expectantly flowering but likewise won’t have time to ripen fruits. 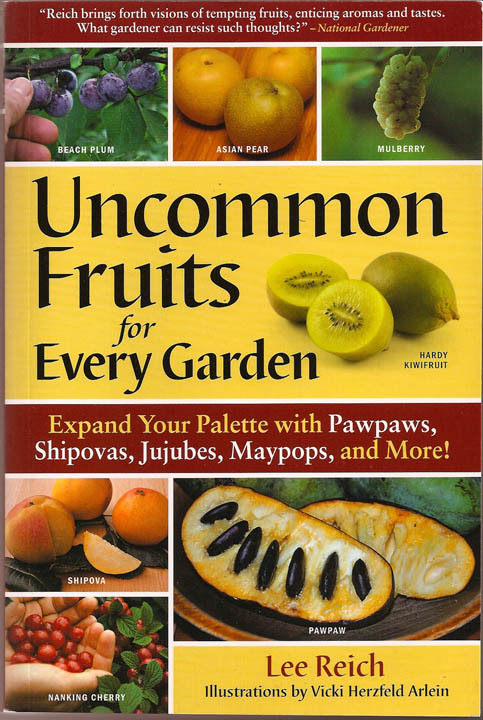 Fruiting trees in the ground included quince (Cydonia oblonga), jujube (Ziziphus jujuba, yes, the original jujube candy was made from candied jujube fruits), and, in the back, more Asian persimmons and pawpaws. 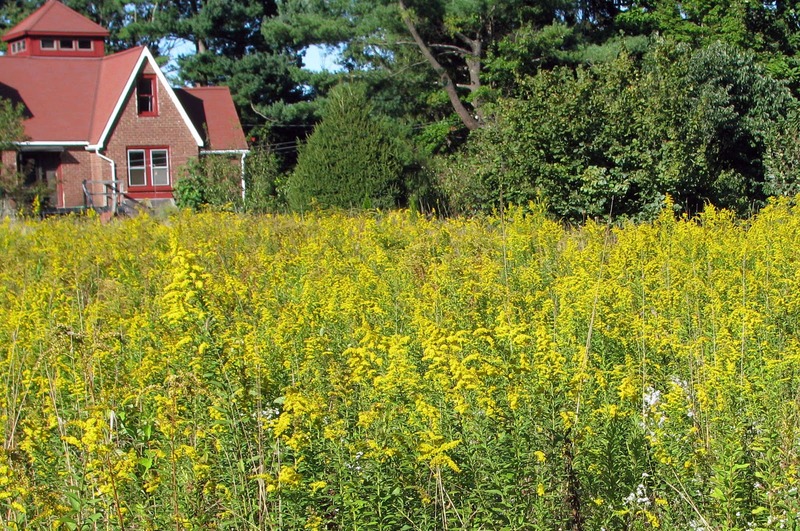 I mow most of the south field once a year, in spring, a schedule that suits the goldenrods well. Other parts of the field that I used to mow more frequently than once a year (for a volleyball court) are mostly grasses, Queen-Anne’s-lace, and chicory, but I see some goldenrod now finally creeping in. I keep a path mowed through the field that each year follows a different trajectory. 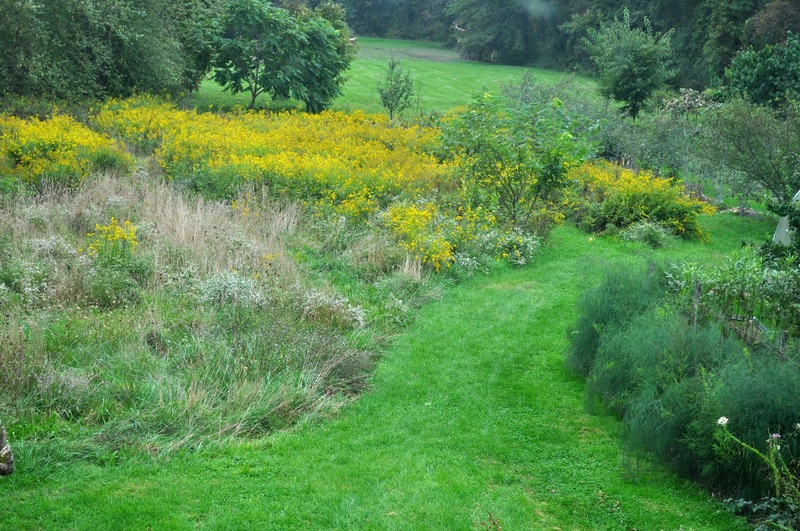 The ghost of last year’s path is high with vegetation, but not goldenrod -- yet. There’s even a tropical-looking patch in the field where the large leaves of sumac seedlings shoot skyward above the surrounding goldenrods. That sumac is the legacy of a brush pile that I burned there over 10 years ago.